People can deposit idle gold with authorised agencies and take advantage of the price escalation of gold as well as earn interest on the deposit. 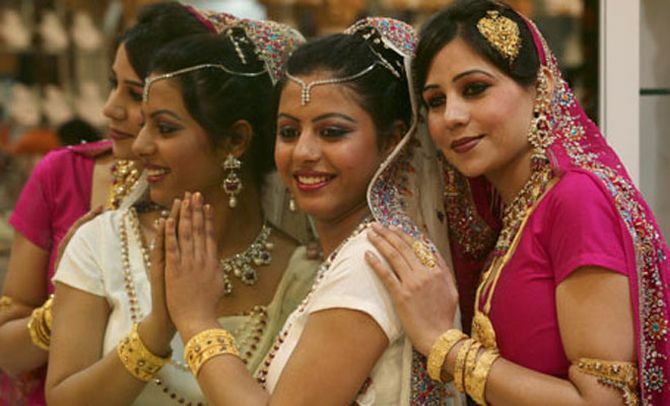 The Cabinet on Wednesday approved Gold Bond and Gold Monetisation schemes to reduce the metal's demand in physical form and fish out idle gold lying with households and other entities. "It is safer and economically more stable to go under both these schemes," Finance Minister Arun Jaitley said after the Cabinet meeting. The Gold Bond scheme will have an annual cap of 500 grams per person and such bonds would be issued for a period of 5-7 years. "The Cabinet on Wednesday cleared the Gold Bond scheme. Under this scheme instead of buying physical gold, Indian residents can buy the gold bonds," Jaitley said. The Budget 2015-16 had proposed to launch a Sovereign Gold Bond (SGB) scheme to develop a financial asset as an alternative to gold. The bonds will be issued in 2, 5 and 10 grams of gold or other denominations and the tenor of the bond could be for a minimum of 5-7 years so that it protects investors from medium-term volatility in gold prices, Jaitley said. As regards the Gold Monetisation Scheme, the minister said people holding idle gold can deposit it in banks for either short, medium or long term. "This is not a black money immunity scheme and normal taxation laws would be applicable," Jaitley said when asked if this was an immunity scheme. He said around 1,000 tonnes of gold is imported annually and people hold such quantum of idle gold just for investment purpose every year. By taking advantage of gold monetisation scheme, people can deposit idle gold with authorised agencies and take advantage of the price escalation of gold as well as earn interest on the deposit, he said. Jaitley said: "The deposit tenure would be short, medium or long term and if the idle gold is deposited in banking system then at the time of redemption people can get the actual value of gold and physical gold can be obtained if it is a short-term deposit. Besides, people will also get the interest." The gold monetisation scheme was also announced in the Budget for 2015-16. The gold mobilised under it, Jaitley said, will be used in auctioning and replenishing RBI's gold reserves. Besides, it would be utilised in making India Gold Coin, which will have the Ashok Chakra, and even for lending to jewellers so that gold need not be imported, he said. Jaitley said the notification and date of implementation of the gold monetisation scheme would be announced very soon. Seeking to mobilise large amount of idle gold held by households and institutions, the government in May proposed a new scheme offering tax-free interest on depositing the yellow metal with banks. The draft gold monetisation scheme also provides for incentives to the banks, while individuals and institutions can deposit as low as 30 gm of gold, while the interest earned on it would be exempt from income tax as well as capital gains tax. As regards Gold Bond scheme, Jaitley said the interest on these bonds would be decided keeping the market rate into view and redemptions can be done through banks, NBFC and Post Offices.